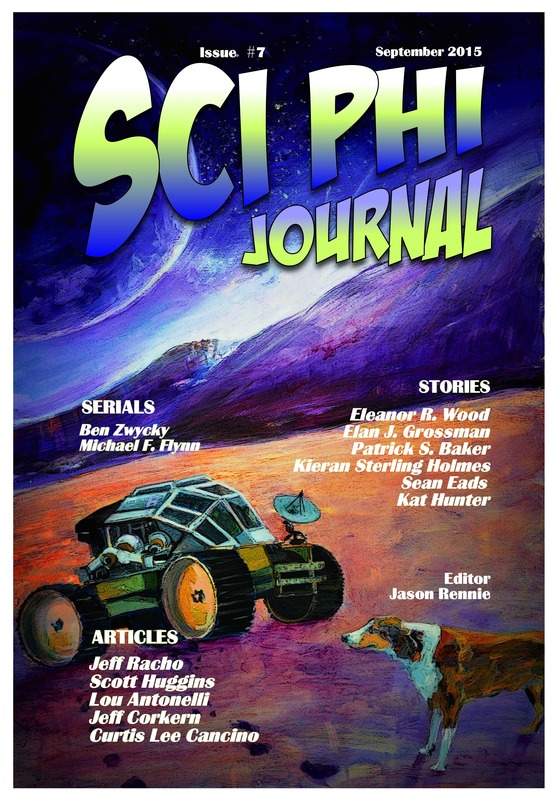 My sci-fi story, ‘Pawprints in the Aeolian Dust’ is now available in Sci Phi Journal. It’s a story about grief, the exploration of an uncharted planet, and the incomparable bond between humans and our dogs. Philosophically, it questions whether pioneering space involves breaking an ancient pact forged between our ancestors and those of our canine companions. Wherever we’ve historically explored, they’ve accompanied us. Wherever we’ve settled, they have too. What happens when we colonise another planet? Will they ever be able to follow? This story is deeply personal, as I wrote it shortly after losing a beloved dog to old age. He was the story’s inspiration, and I owe a debt of gratitude to Sci Phi’s exceptionally talented cover artist, Cat Leonard, for not only choosing my story for this issue’s cover, but featuring my departed boy in her painting. Editor Jason Rennie mentions him by name in the editorial, too… the whole issue feels like a tribute. I’m touched, and grateful, and really excited to be able to share this story. You can purchase it on Kindle (UK), Kindle (US), and in print. I’m a writer who also happens to be a qualified proofreader and copy editor. Not all writers are grammar nuts or perfect spellers or great at spotting typos in their own work. Even those that are still miss things when they’ve been staring at the same manuscript for weeks/months/years on end. But having a polished manuscript is essential when submitting your work to traditional publishers. And having a perfect manuscript is crucial when self-publishing. Increasing numbers of authors are opting to self-publish these days. The pros are obvious: your work’s out there, right away, for anyone to purchase, all under your own terms. You retain all rights. You bypass (or give up on) the gauntlet of rejection that comes with the traditional publishing route. You’re in complete control of marketing. You keep 100% of the book’s sale price. Of course, you also have to pay your own publishing and marketing costs, you don’t have the contacts and confidence of a solid publisher behind you, you have to make significant sales in order to rise above the masses of self-published volumes out there, and you have to prepare the entire manuscript, as well as the cover and blurb, yourself. There are some great writers choosing this route, and many self-published books deserve to stand shoulder-to-shoulder with traditionally published ones. A well-written, self-published novel should be indistinguishable from a well-written, traditionally published novel, but there’s a trend that makes many self-pubbed novels stand out against their traditional counterparts, for the wrong reasons. A traditionally published book will have been handled by a team of editors, proofreaders, copy editors and typesetters before it’s ever available for purchase. Most self-published books haven’t been given anything like this 5-star treatment, and too often, it shows. At the very least, both writers and readers want books that are free of typos, spelling mistakes, and grammatical errors. These issues are why proofreaders exist. And that brings me to my point. I have an eagle eye for typos. Spelling has always come naturally to me, and I have a keen grasp of grammar. I want to help fellow writers produce polished, professional-looking manuscripts for self-publication so that their books stand a greater chance at holding their own alongside the traditionally published ones. I want to help those opting for the traditional route to submit work that is professional-looking from the outset. And I want to provide these services at a discounted, affordable rate. proofyourwork [at] rocketmail [dot] com. For more info, check out Proofreading & Copy Editing.